Sixteen marks question of English Literature is asked in ICSE examination and this is asked to comment about the main character or the main story of the chapter. For example this quesition will be asked as given below. The sacrifice of the unsung heroes in the Mumbai Terror Attack of 26/11 is highlighted and their patriotism was epitomised. Discuss with reference to the story. In the wake of Mumbai Terror attack, the country saw some of the greatest patriots joining hands to fight terrorism. Terrorism had never been so brutal, so devastating. People had seen the wrath of the terrorists making innocent people their victim of anger. Mumbai tourists, Indian and rest of India stood transfixed at the horror that the terrorist fired on innocent lives. Few people realized at that point that life is jeopardized badly due to unscrupulous thinking of the certain men. Hotel Taj the heritage hotel of Mumbai was under seize. Dinner dining in one of the most famous restaurant failed to see the light of another day. Terrorists burst into the hotel and started fighting aimlessly . Four hostages were taken and young old men, women and children where held at mansion; while the terrorists danced the Deadly Dance . Life came to a halt and rest of India sat viewing to their television set as horror unveiled its naked face. 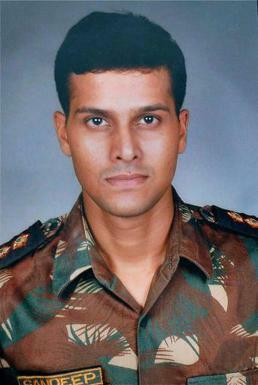 Commander Sandeep UnniKrishnan; young soldier was sent to combat the terrorizing force . The young soldier did not think about the consequences and took it upon his stride, shielding his comrade and non-chalently embracing death in the process of the operation. Sandeep Unnikrishnan was martyired.The whole country saluted the sacrifice of this young blood . His bereaved parents were proud of him, but this country once again lost a young blood at the altar of terrorist attack. The terrorists did not spare anyone as they moved on ruthlessly attacking with meticulous planning. Various places where bubbling with innocent pupulous of Mumbai. The next destination of terrorist was railway station where people running to and fro caught unaware by the impending danger. Vishnu Zende teh announcer for the night sensed trouble. Instead of shielding his own life , he thought it as his utmost duty to help commuters giving continuous directions to the innocent people to escape the blood bath. Karambir the general manager of the hotel Taj disregarded the safety of his own immediate family and joined hands to rescue others. His wife and son being trapped in one of the rooms of Taj died of suffocation. He fought for the safety of his guests and became one of the many unsung heroes ; who can defy terrorism with utmost breadth and determination. Three police officers Hemant Karkare, Ahok Kamte and Vijay Salaskar embraced death as they wanted to intercept the terrorists on the way to destruction. Chhotu chaywala staioned in front of the Mumbai station helped many without thinking the safety of his own life and thus was enlisted one of the many unsung heroes . The sacrifice of sundra Samuel safeguarding the life of two year old toddler went down the street glorifying the service of a dedicated governess. She saved him when Nariman house was attacked and the child's parents were killed. Except one all the terrorists were gunned down but they were denied a proper burial by the caretakers of Cemetry showing to the world that humanity is above all and heroes are ordinary men who rise to the situation above all proving to one and all that all value can be squashed with just determination.